More of the nation’s apartments and condos are going green as multifamily builders and developers respond to growing consumer interest in sustainable building practices, according to a recent survey by the National Association of Home Builders (NAHB). While a majority of the survey respondents – 74 percent – said that buyers and renters are willing to pay more for green amenities, the median additional amount they are willing to pay is only about two percent. Pictured left is Oakland Park, which is a prime example of a new condo development that has incorporated sustainable building practices. 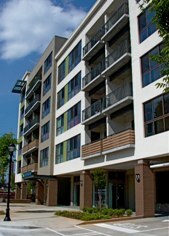 Oakland Park is the first LEED-certified multifamily housing project in Atlanta, and has begun a trend for the city. This entry was posted in Energy Efficient, LEED and tagged energy-efficient appliances, green built condo, oakland park, sustainable building on August 28, 2008 by Carol Morgan.